Yay! It's February - one step closer to spring. You know things are getting bad when you find yourself stroking the summer clothes in your wardrobe in a wistful way. 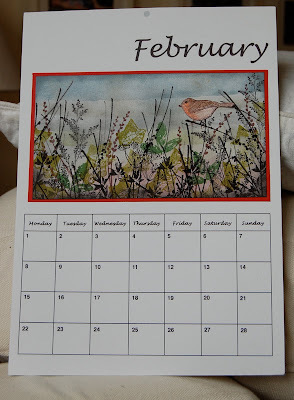 Readers of this blog will know that I don't buy a calendar for my hallway - I just make a calendar page each month. It works for me! I try to reflect the seasons and I think I'm getting there with this. We're having a cold winter here and the birds are getting a bit frantic in their search for food. We have to put bird food high in the tree in our tiny garden as the cat keeps wandering about out there licking her lips. Here's a close-up. 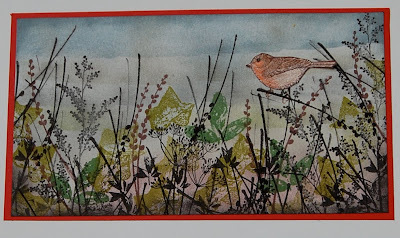 I used masking and sponging for the background; the bird is from SU Touch of Nature, weeds from SU Garden Silhouettes and Autumn Days; and leaves from a Clear Choice stamp set. Now, if you'll excuse me, I must get back to the crafting table. you are so incredibly gifted and talented. I'm so pleased I found your blog. Thank you so much for sharing your creations with us. May I ask where you find the calendar days to print off. I'm assuming they come from some website. What an adorable calendar page! Love how you've stamped on it to personalize it! Thanks for your lovely comments ladies. I made the calendar page on my computer. Later I'll post them as PDF files so that you can download them if you'd like to. If you have one of those wire spiral bindy things (I'm sure that's NOT the technical term!) you could make a full calendar that would be a great personalised gift.